The BearCub is really into cooking lately and I’m not one to discourage culinary skills in a man! We do a lot of ‘play’ cooking and he loves creating me weird and wonderful meals to pretend to eat. However, when he really wants to get messy and do the real thing I send him to aunty!! My sister lets BearCub do everything I would never let him do: unload the dishwasher, play guitar (a real one), rearrange her cupboards and cook with ‘real’ food!! I guess that is what favourite aunties are for! 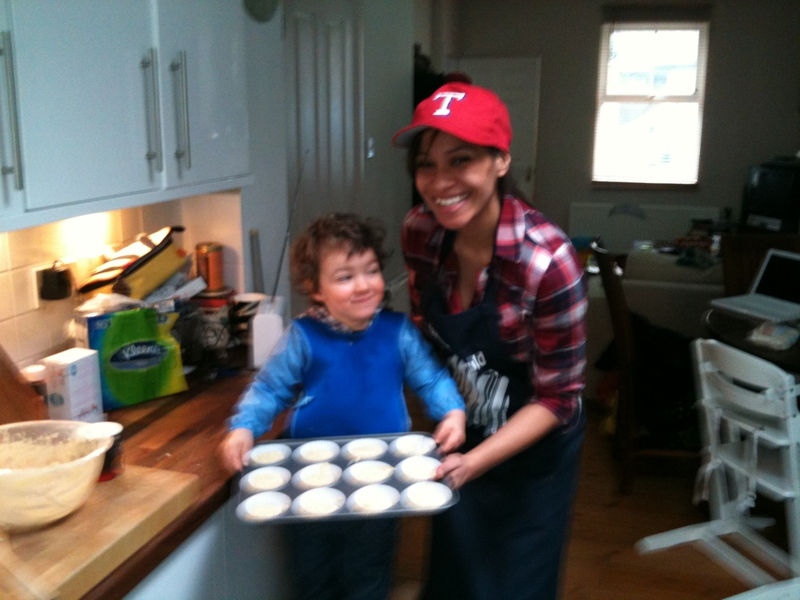 Well last time she let BearCub lose on her kitchen they made some actually really delicious cakes and when I asked her about it she told me she found the recipe designed for kids to really get involved and do most of it themselves – which of course BearCub loved. So I thought I’d share it. It’s great to find kid friendly recipes and always a bonus if the result is edible!!! THE ADULT: This recipe is a lot easier if the butter is soft. YOU – Pour all the ingredients for the cakes (not the Butter Icing ingredients) into a bowl and start off the mixing. Preheat the oven to 170 C / 325 F / Gas Mark 3. YOUR CHILD – Continue mixing until all the ingredients are well mixed together. Use a spoon to fill each cake tin about half to two thirds full with cake mixture. YOUR CHILD – Place the filled cake case on a baking tray. A flat tray is fine but if you have a bun tin with cake case holes, all the better (click picture on right to enlarge). 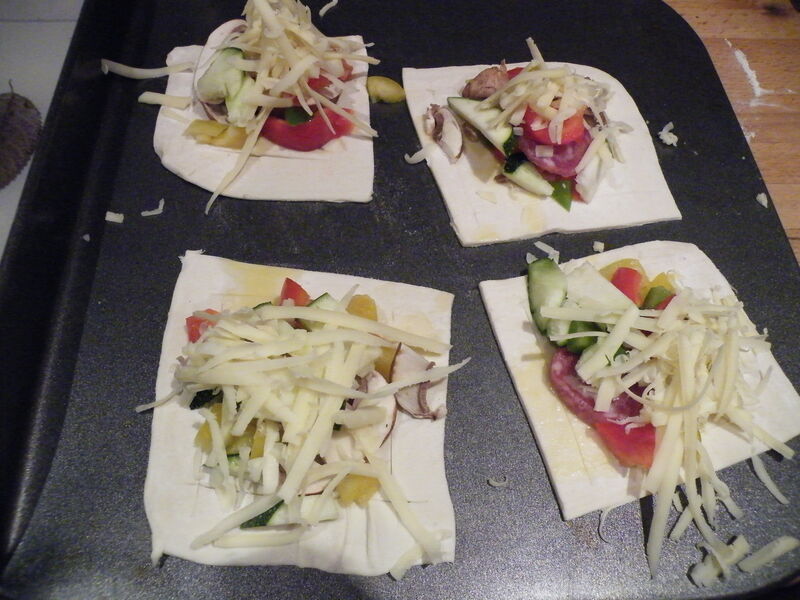 YOU – Place the baking tray in the pre-heated oven (170 C / 325 F / Gas Mark 3). Put it in the middle of the oven and cook for 30 minutes. Do not open the oven door for at least 20 minutes. If you do, the cakes may well collapse. They are cooked when golden brown. YOU – Use a sharp knife to slice off the top part of each cake. Click the picture on the right to get a better idea of the size of the slice. Cut the sliced off cake into two, these will be used later to form the wings of the butterfly. YOUR CHILD – Place all the ingredients for the butter icing in a large bowl and stir for about five minutes until all the ingredients are well combined. YOUR CHILD – Place about a teaspoon full of the butter icing on top of each cake. Then push the “wings” into the butter icing. More decorations can be placed on the cake depending on what is available. 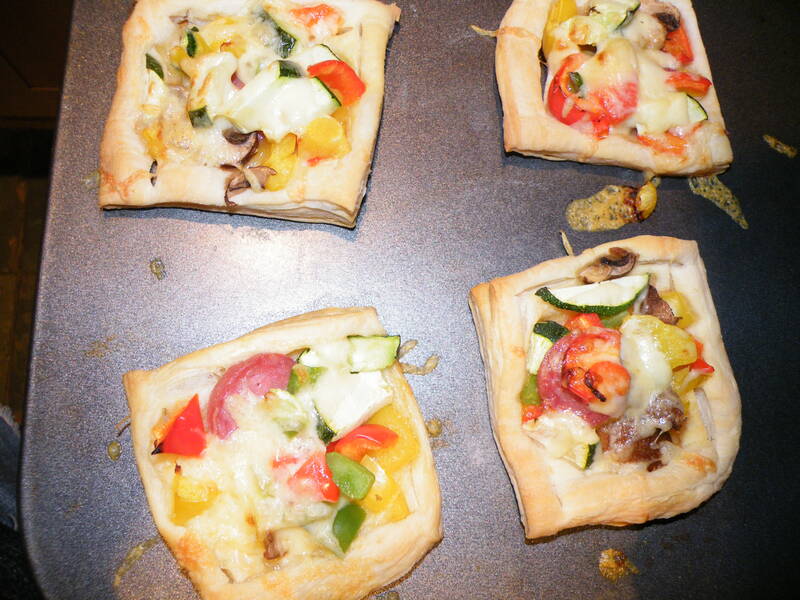 This entry was posted in Activities, Fun things to do, Recipe and tagged family fun, ideas, Preschooler, recipe. 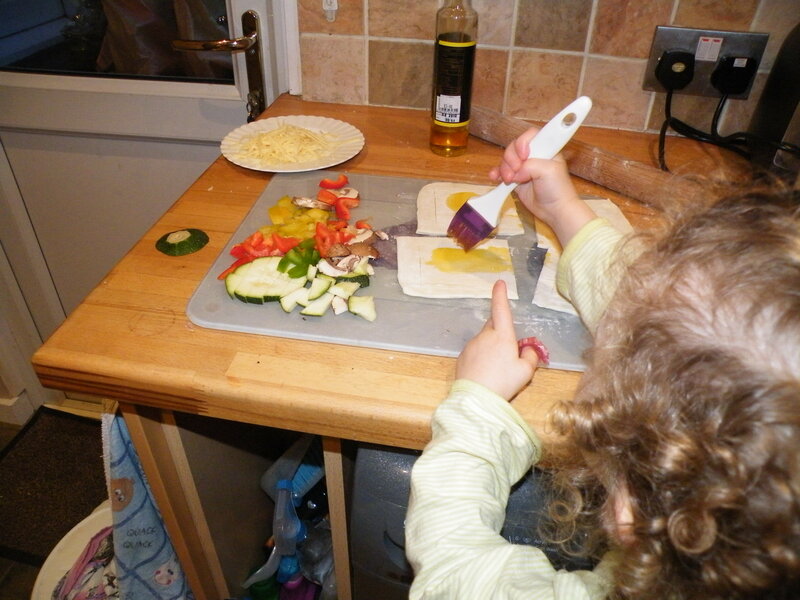 Here’s a healthy fun toddler snack that we’ve been making and taking places for the last couple of weeks. There are just enough ‘naughty’ things for Munchkin to think that this is a treat and enough healthy things for me to feel happy that she’s getting something that’s doing her some good. It also seems to be something that for some reason Munchkin loves to share with her friends, which is unusual, and the fact that she can help to prepare means it’s an activity too! 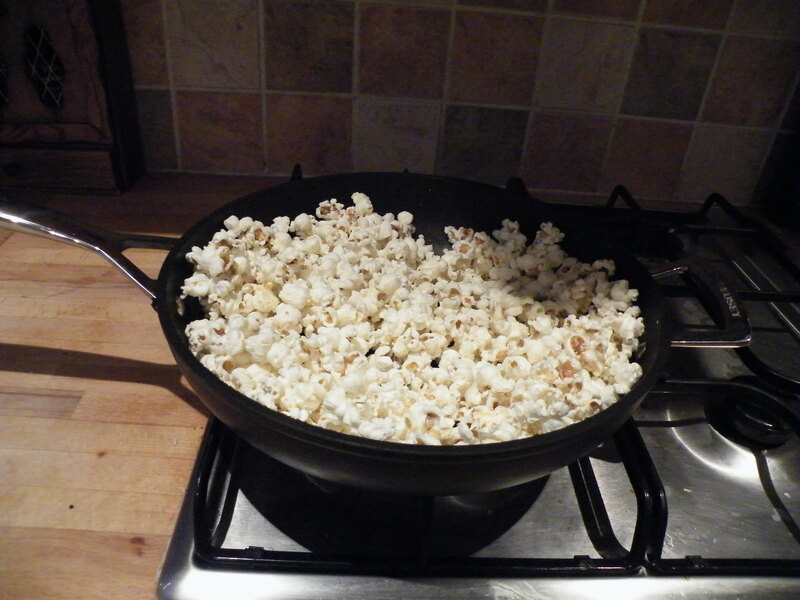 Firstly we pop some pop corn – I do this in a glass topped pan on the hob as we don’t have a microwave. 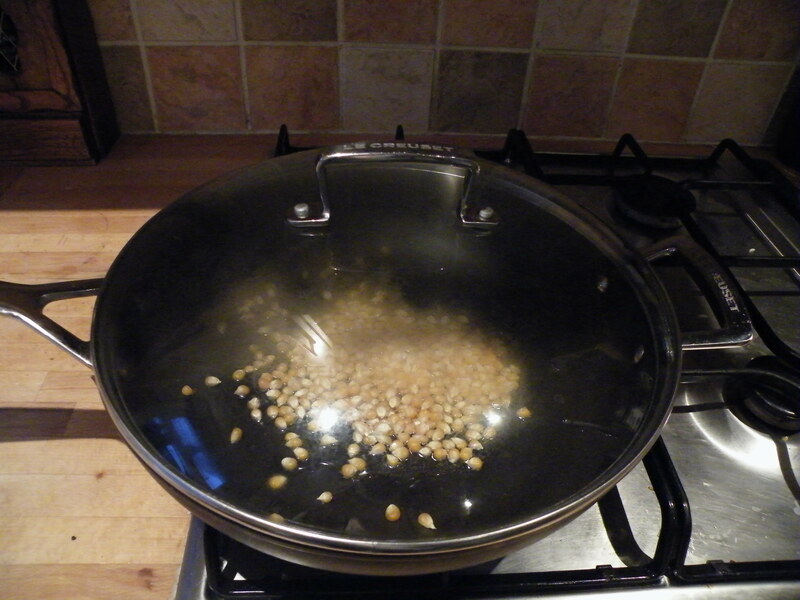 So, we put a tablespoon of oil in the pan (for a lightly salted version, use butter and oil) and add popping corn. Stick the lid on a watch the fun! Mucnhkin and try to shout “NOW” when the first corn pops. We put most of an amount like this into an airtight box to store and use as we need to. Then put a handful or two into a suitable bag or box for taking out and add munchkin’s favourite extras. In the one pictured below, we have added raisins, dried apple, dried mango and pinapple and then the extra treats were a few rice puff M and Ms and some Fruit Factory hearts. 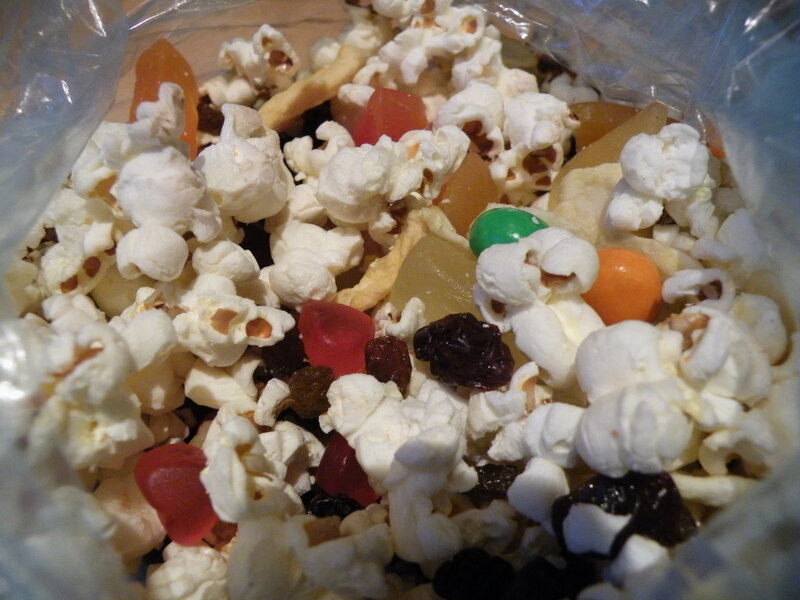 Toddler trail-mix: it’s yummy enough that even I share it sometimes! 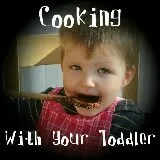 This entry was posted in Recipe, Toddlers and tagged recipe, Toddler. So, I’ve been wondering what to write all day. What do More Than a Mum readers want to read on a Friday? Then, as I was cooking dinner, it came to me… Friday Night Curry. This is one that I’ve been making for munchkin from a very early age. We all love it and it goes down very well with popadoms and chutney. It also freezes brilliantly so is a good stand-by. I discovered it by mistake when I over cooked butternut squash while trying to make a curry for us pre-child! Fry onion in oil until clear. Add garam masala and fry for a minute. Add Butternut squash and cook for a further 5 minutes. Add enough water to cover the squash, cover and cook until squash is very soft (top up water if necessary, to stop it boiling dry). Once soft, mash with the back of a spoon (or whizz with a blender if you have more time and like a smoother sauce) and add the coconut cream and chickpeas. Cook for a further 10 minutes. Serve with rice, chutney and popadoms. This is a reasonably new one to my cooking repertoire, but something I always order if we have take-out. The creamy nature of the sauce means that spinach is wolfed down by munchkin despite her usual squirming at the sight of green veg. Blend spinach into a smooth paste. In large pan heat oil and fry onion until clear. Add spices and fry for a minute. Add ginger and garlic and fry for another minute. Add the paneer and fry for about two minutes, turning the paneer to ensure all sides are evenly cooked. Add the chillies (if you are using them) and cook for a further minute. Add the spinach and enough water to make a loose sauce. 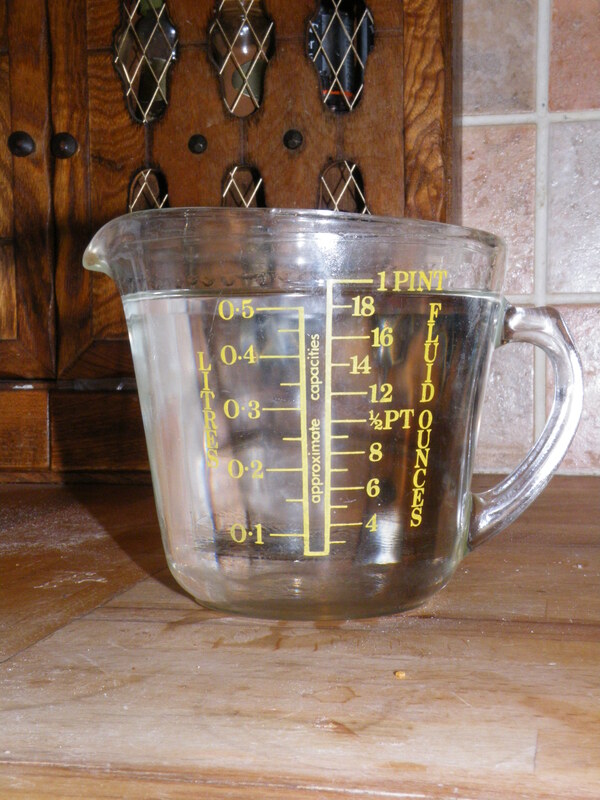 (Not too much or it will be watery) Simmer for a few minutes then add the cream. Add salt and lemon juice to taste. (If you want a spicier flavour, burst the chillies and leave the curry to sit for up to 24 hours – you could always scoop out the kids portions first) Serve with naan or chapattis. This is a lovely all in one dish and by substituting veg for chicken, it can be a dish that is suitable for meat eaters and vegetarians alike. This was a recipe given to me by my friend’s mother, who grew up in the Punjab, so it’s even authentic! Blend tomatoes, garlic, ginger and chillies (if using) in a food processor. Put oil in a pan, fry cumin for about a minute, until aroma is released. Add onions, fry until clear. Add blended ingredients. Add turmeric and salt. Simmer for 10 minutes. Add Garam Masala, simmer for a further 10 minutes. Add yoghurt. Add the chicken (or veg) and simmer until cooked through. Whilst simmering sauce, cook the rice. Into an oven proof dish, layer half the rice, cover with half the chicken/veg sauce and cover this with yoghurt. Cover this with a final layer of rice, then the final layer of chicken/veg sauce and finally cover with yoghurt. Cook in the oven (uncovered) for about 20 minutes. So, there you are a choice of curries of varying complexity for your very own Friday Curry Night. I hope you enjoy! 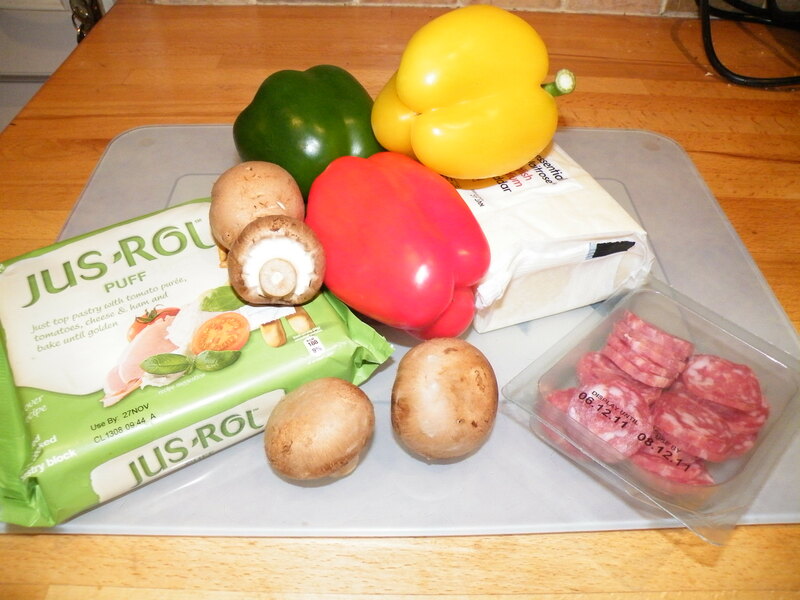 This entry was posted in Recipe and tagged budget, cooking, family meals, recipe. When it’s cold and wet outside, it’s sometimes nice to stay indoors. Whereas pre-toddler I could stay in doing not much of anything, just pottering, now I need to have activities lined up and entertainment laid on if I don’t want to brave the park. Often, Munchkin and I cook together, so when I saw this linky over at Jessie’s Crazy Kitchen I thought it was the perfect opportunity to share one of our favourites: PIE! This is one that I usually do in the afternoon with Munchkin and then she has them for her dinner. We often join her too, because they really are yummy. What ever you have in the house! The only must-haves are puff pastry and oil. This makes 4 small pies (1-3 usually fill munchkin up depending on her hunger. 3-4 fills the OH (though usually with extra veggies). First roll the pastry out into a square about 20cm. Divide square into quarters and score around each square about 1-2cms in from the edge. Next paint oil on the pastry inside the scoring. Then load the pastry with goodies! Try to keep food inside the scoring as the pastry outside will rise. Pop in the oven for about 10 mins at 180 degrees C.
This entry was posted in Activities, Recipe, Toddlers and tagged family fun, ideas, inspiraton, Preschooler, Toddler. Shake daily for a week and then weekly for at least 7 weeks. Sieve through an old muslin (I knew I’d find a use for them!) into a sterilised airtight bottle. 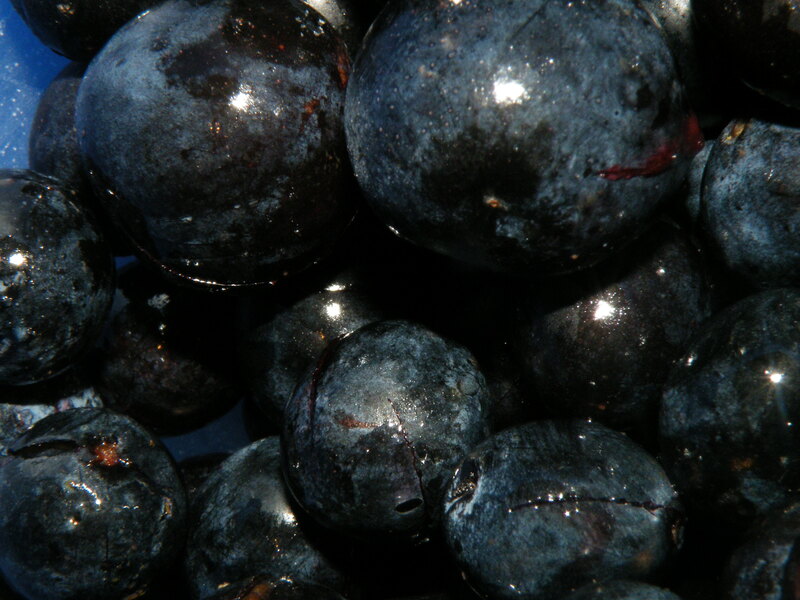 This entry was posted in Recipe and tagged gin, Me Time, recipe, sloe gin.